I've been all about the edible sensory activities lately so that the babies in my care can enjoy the activities too. The Edible Slime we did was a hit by both the kids and myself. I found an Edible Water Beads activity on Pinterest (because, where else??) and decided to give it a go. After making, setting up, and playing with these edible water beads, I can say I will never again be doing this activity...and it takes a lot for me to say that! I have never dealt with anything as sticky as these "beads." So sticky that it took the fun right out of playing. 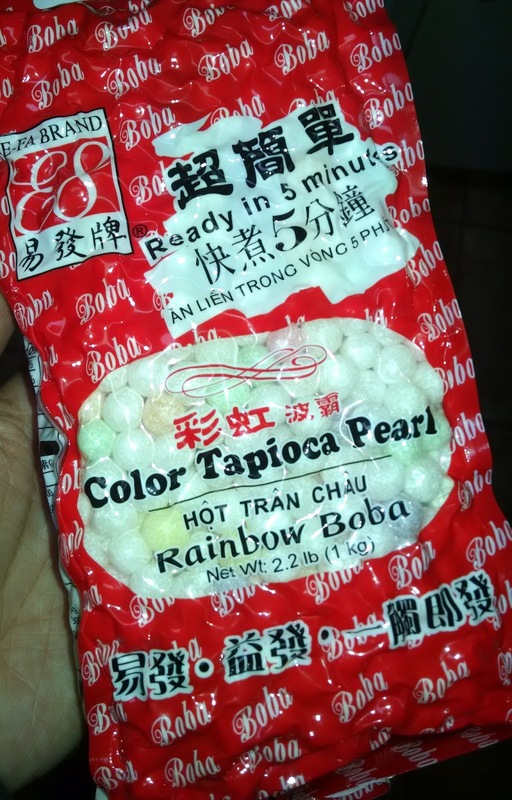 I made the Tapioca Pearls according to package directions, minus the honey and sugar recommended to be put on afterwards. The babies can't have the honey and I didn't feel the need to give the kids any extra sugar. I doubt adding those two things in would have made much of a difference as far as the stickiness went. Even though they were slimier and slightly sticky after making, I still had in my mind that they would be kind of like water beads. I had set up our regular water bead play station (a long Sterilite container and some animal figurines for playing since all of the kids are interested in animals at the moment). When I pulled the Pearls out of the refrigerator I discovered that they were even more stickier than before. Too sticky for regular water bead play as intended. Instead, I kept them in the bowl they were in, brought the Little Tikes play kitchen into the kitchen, set up tables and chairs, bowls, and spoons. Thankfully I changed up how the kids would play with them or I doubt they would have played with them at all because they more they played with them, the stickier they got. I really can't emphasize enough just how sticky these little suckers were. If you poked at one, it was practically glued to your finger. You could try to pull it off with your other hand but it would just get stuck to that hand. The only way to get those things off was by running the body part under cold water....and then they just stuck to the sink. The only bonus to this activity is that the babies really didn't try to eat them at all because of the texture. Hopefully that means we can give regular water beads a go soon because I am never again doing edible water beads. No one liked the taste of the beads and they got stuck to all of the little toes.